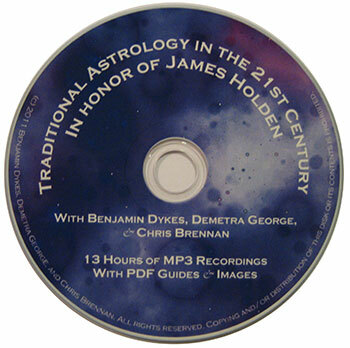 In September 2011 the American Federation of Astrologers hosted a three-day conference titled Traditional Astrology in the 21st Century, In Honor of James Holden. The conference consisted of talks on the history, philosophy and techniques of Hellenistic and Medieval astrology presented by Demetra George, Benjamin Dykes and Chris Brennan. This recording of the conference features 13 hours of audio lectures in MP3 format, along with many diagrams, handouts, lecture slides, and other material from the conference presentations in PDF format. Demetra George, M.A. Classics has practiced astrology for more than 35 years, and specializes in archetypal mythology and ancient techniques. She is the author of Astrology For Yourself, Asteroid Goddesses, Mysteries of the Dark Moon, Finding Our Way Through the Dark, and Astrology and the Authentic Self. She lives in Oregon, lectures internationally, and leads pilgrimages to the sacred sites in Greece, Egypt, and India. Her forthcoming works include a translation of Hermetic Astro-Medical texts and Traditional Astrology: An Introductory Study Guide and Workbook. She offers astrological consultations and mentors individual students in all levels of astrological education. Dr. Benjamin Dykes is a leading medieval astrologer and translator who earned his PhD in philosophy from the University of Illinois. He received his medieval astrology qualification from Robert Zoller and taught philosophy courses at universities in Illinois and Minnesota. In 2011 he published three horary works: The Search of the Heart, al-Kindi’s Forty Chapters, and The Book of the Nine Judges. For modern astrologers, he published Traditional Astrology for Today in 2011. He currently offers the Logos & Light philosophy lectures on MP3 and speaks to astrological audiences worldwide. Chris Brennan is a practicing astrologer and researcher from Denver, Colorado. He was educated at Kepler College, where he focused on cross-cultural comparisons between the astrological traditions, and he also spent two years studying at Project Hindsight. He is the former President of the Association for Young Astrologers, as well as the former Research Director of the National Council for Geocosmic Research. His forthcoming book is titled Hellenistic Astrology: The Study of Fate. The complete conference recording is available for purchase as a digital download for $90 USD. The digital download which contains all of the MP3 and PDF files from the conference comes packaged together as a single 375 MB zip file. Click the “buy now” button below in order to purchase the recording. You will be redirected to PayPal in order to make your payment, and then you will receive a link to download the recording as soon as you complete your purchase.